I’d almost given up on writing about Europe when we hit the crazy pre-holiday season at my new job a few weeks back, but just thinking about that summer adventure brings a goofy smile to my face and makes me slow down as I get used to working life. I don’t think I’m ready to write about work yet anyway, so now I’m determined to keep writing about Europe even if it kills me takes a few more months than originally anticipated. Mazel tov! 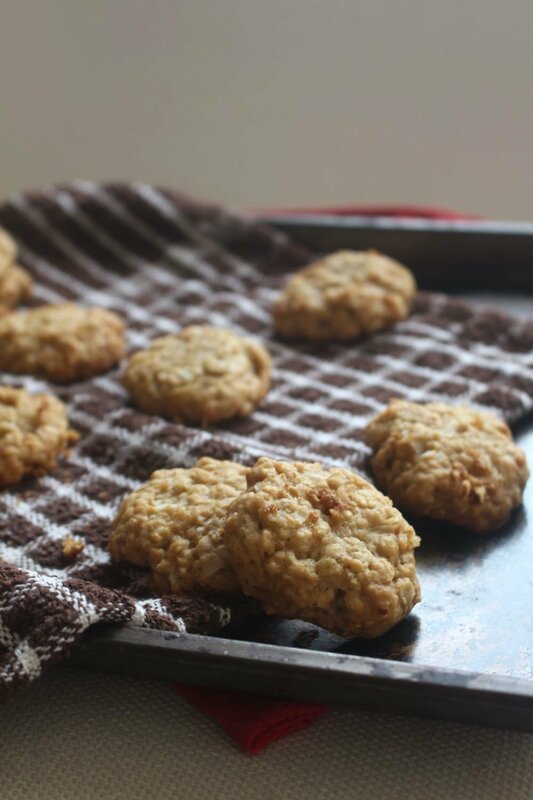 As it so happens, Anzac Biscuits aren’t a European invention at all: They’re a traditional Australian hard biscuit first created by wives during WWI and shipped to the front lines because the egg-free treats could last so long in transit. Or at least that’s what Marty–the cheery, enthusiastic Australian guy I met on my second night in Dublin–tells me. Marty can only be described as the kind of inspirational that, if you’re lucky, you encounter once in a lifetime. Like me, Marty was making a solo trek through Europe, paying visits to friends along the way and stretching his wanderlust wings as he trekked through several of the continent’s largest cities. 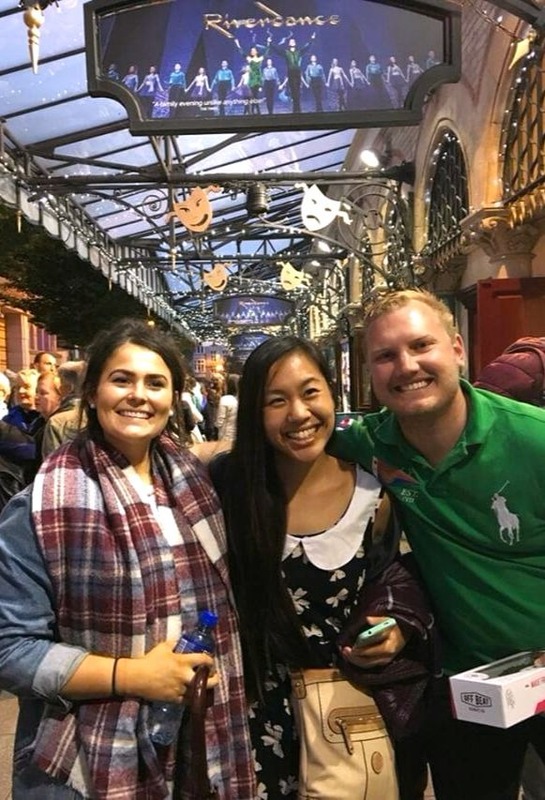 We met at the Riverdance, and it became immediately apparent that Marty’s joy for life–magnified tenfold by his thick, jovial Aussie accent–was effusive. By the time intermission ended, I’d agreed to grab a pint with him after the show (the friend he was visiting in town had work the next morning and couldn’t join us)–and an hour later, we were out roaming the streets of downtown Dublin, soaking in the sights of a rushing city thousands of miles from both of our homes. After crossing the main bridge, we found a local bar with amazing live music (or, as Marty put it: “Ripper!”) and ducked inside to chat. Though I don’t drink as a general rule, it seemed fitting to order an iconically huge Irish pint of Guinness before we took our seats, belting out the words to classic songs that I pretended to know and that Marty could have chanted in his sleep. Between our sips and smiles, he shared his dream of someday becoming a referee for a Superbowl game; I told him about my anxieties surrounding a new career and finding work-life balance. We laughed about our exes, commiserated over our dearth of vacation days, celebrated our freedom as travelers trotting the globe one city at a time. Afterward, he walked me back to Trinity College where I was staying, gave me a friendly peck on the cheek, and we parted ways. 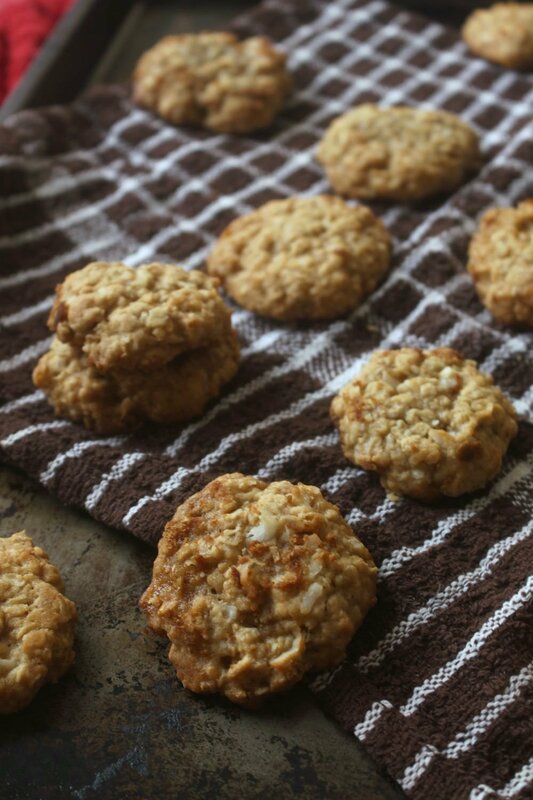 When I asked Marty a few weeks ago if he had a favorite recipe that I could share for this post, he consulted with all of his friends to find the perfect Australian dessert that I could make and wouldn’t settle until overwhelming consensus agreed on these Anzac Biscuits. Because that’s the kind of person Marty is–sweet, thoughtful, and always ready to go the extra 500 miles kilometers for everyone around him. He even sent me the recipe for these cookies–er, biscuits, sorry for the Americanism–and everyone who tried them loved them! Till then, thanks for the adventure, M–and happy holidays filled with Anzac Biscuits to all! These classic hard Australian biscuits are sweetened with golden syrup and coconut flakes. They're egg-free and make for the perfect shippable gift during the holiday season! Preheat oven to 350°F/170°C. Line 3 baking trays with baking paper and set aside. Combine oats, flour, sugar and coconut in a bowl. Set aside. Place butter, syrup and 2 tablespoons cold water in a saucepan over medium heat. Stir for 2 minutes or until butter has melted. Stir in bicarbonate of soda. Stir butter mixture into oat mixture. Roll level tablespoons of mixture into balls. Place on trays, 5 cm apart. Flatten slightly. Bake for 10-12 minutes or until light golden. Stand on trays for 5 minutes, then transfer to a wire rack and allow to cool completely before wrapping up and sending to your loved ones!